On this day in 1948 Reed Elsevier listed on the LSE. The following chart plots the average monthly out-performance of the shares over the FTSE 100 Index since 1988. For example, on average Reed Elsevier has out-performed the FTSE 100 by 2.2 percentage points in February. The strongest month for Reed Elsevier shares relative to the market has been February (the shares have out-performed the market in this month in 18 of the last 25 years). The weakest month for Reed Elsevier relative to the market has been April (the shares have only out-performed the market in this month in 10 of the past 24 years). Reed Elsevier is in the FTSE 350 Media [NMX5550] sector. On this day in 1979 Legal & General Group listed on the LSE. The following chart plots the average monthly out-performance of the shares over the FTSE 100 Index since 1988. For example, on average Legal & General Group has out-performed the FTSE 100 by 1.4 percentage points in August. The strongest month for Legal & General Group shares relative to the market has been August (the shares have out-performed the market in this month in 14 of the last 25 years). The weakest month for Legal & General Group relative to the market has been April (the shares have only out-performed the market in this month in 9 of the past 25 years). Legal & General Group is in the FTSE 350 Life Insurance [NMX8570] sector. Tomorrow will be the last trading day (LTD) of April. Since 1984 the market has on average risen 0.19% on the LTD of April, which makes it the 3rd strongest LTD of the 12 months. Since 2000, however, it has fallen to the 5th strongest month LTD, with an average return of 0.13% on the day. The following chart shows the FTSE 100 Index returns for every April LTD since 1984. April is one of the most interesting months for the stock market. Five years ago April was the strongest month for the market in the year, but it is now ranked third. 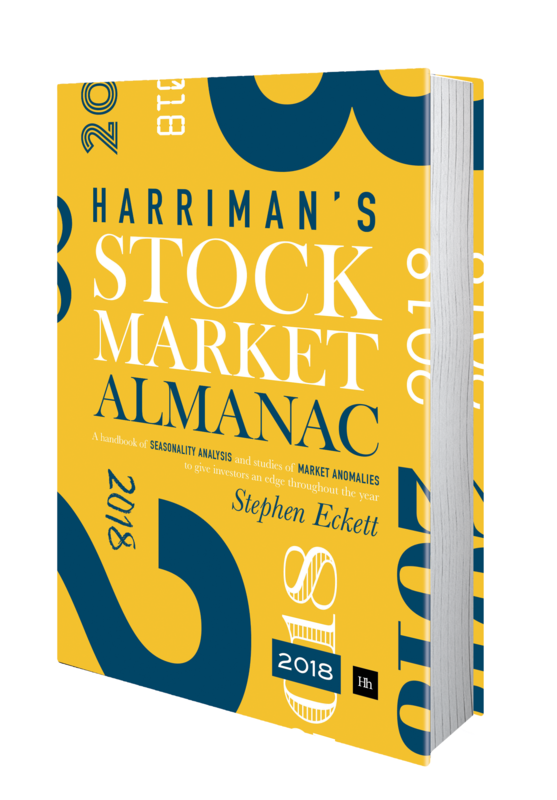 On average the market rises 1.8% in this month; and the probability of a positive return in the month is 68% based on its recent track record. From 1971 the market rose in April every year for 15 years – a recent record for any month. Although the number of years with negative returns in the month has been increasing lately. 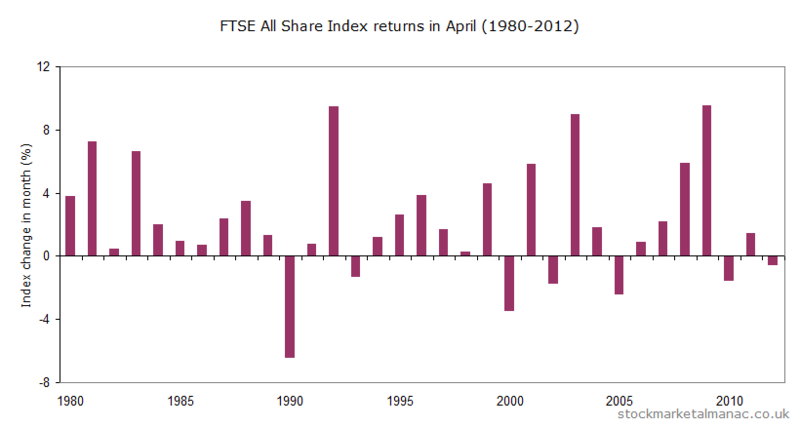 The accompanying chart plots the percentage performance of the FTSE All Share Index for each April since 1980. For example, last year in 2012 the market fell 0.6% in April. 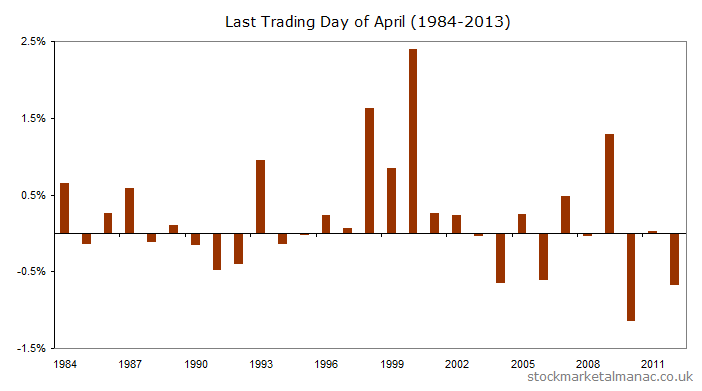 As can be seen, apart from 1990, the market falls rarely in April and when it does the extent tends to be limited. The market often gets off to a strong start in the month – the first trading day of April is the second strongest first trading day of all months in the year. The following table summarises analysis of the historic performance of sectors in this month. From a seasonality viewpoint, the great significance of April is that it the last month in the strong part of the six-month cycle. This is the very odd characteristic whereby the stock market in the period November to April greatly outperforms the May to October market (hence the saying, “Sell in May and go away…”). In the 30 years since 1982 the winter period has out-performed the summer period 25 times, with an average annual out-performance of 9.1 percentage points! The behaviour is extraordinary and should not exist in a modern, efficient(ish) market. But exist it does. Indeed, a similar effect also exists in most other stock markets, including the US. For investors impressed with this phenomenon (and it is difficult not to be), the end of April is the time to sell out, or reduce exposure to the equity market. Finally, in the trivia corner, April marks the anniversary of the introduction of the FTSE 100 Index (on 1 April 1984) and of the first time the index closed over the 6000 level (1 April 1998). Next Tuesday, 2 April, will be the first trading day (FTD) of April (and therefore also of the second quarter). 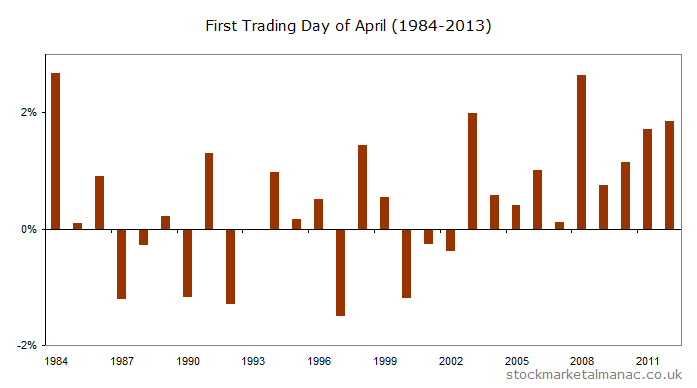 The April FTD has been the second strongest month FTD of the year: since 1984 the FTSE 100 Index has increased on average 0.47% on this day. From 2000 the average return on the day has been even higher at 0.79%; and from 2003 the market has never fallen on this day. On this day in 1991 Aberdeen Asset Management listed on the LSE. The following chart plots the average monthly out-performance of the shares over the FTSE 100 Index since 1994. For example, on average Aberdeen Asset Management has out-performed the FTSE 100 by 5.6 percentage points in December. The strongest month for Aberdeen Asset Management shares relative to the market has been December (the shares have out-performed the market in this month in 14 of the last 19 years). The weakest month for Aberdeen Asset Management relative to the market has been April (the shares have only out-performed the market in this month in 7 of the past 19 years).